Are you looking for new backyard spa ideas for your home? Keep reading to discover 5 of the best outdoor spa ideas that’ll turn your backyard into a dreamy Zen oasis. Spa decking is a functional way to create a relaxing corner in your backyard without clashing with the rest of the exterior design. The idea is to install an elevated spa deck area around the hot tub in order to support its weight, but also to make for a non-slippery surface. You can also include a lounging area right next to the spa. If you have a swimming pool in your yard, you can easily turn it into a spa pool. The process may take a few weeks, but your builders can install the jets and other appropriate mechanisms that can turn any pool into a Jacuzzi. Some pools even come with a spa mode feature, so if you’re considering building one, consult with your builder about this in advance. A hot tub deck is the ultimate spa feature, but if you want to create a true sanctuary, consider adding additional Zen elements. For example, a small water fountain next to the Jacuzzi will help you relax while enjoying a quiet evening. You can also add stones, wireless speakers for playing music, a hammock, a bar, and bamboos. Adding even one Zen element will transform your backyard into a beautiful spa where you can invite your friends and family. Several of the best hot tub ideas are born in the shower, so why not build one in your own backyard? You’ll need to install piping and decide on the enclosure. You can go the simple way and choose a wooden or PVC enclosure. If you want a more luxurious feel, have your builders install a glass shower with tiles or an outdoor bathtub. This is a great way to cool off on a hot day, spend some quiet time with your partner or have a peaceful evening on your own. A shower can complement your spa build with its design features. A beautiful hot tub design deserves romantic, soft lighting. Give your backyard spa area a complete makeover by putting up string lights, pathway lights, candles, and lanterns. You can also use the fire pit to create a warm, cozy atmosphere on colder nights near your spa. Build a Full-Fledged Spa in Your Own Backyard! When life gets too much and you want to relax, these backyard spa ideas will turn your yard into a blissful Zen retreat! 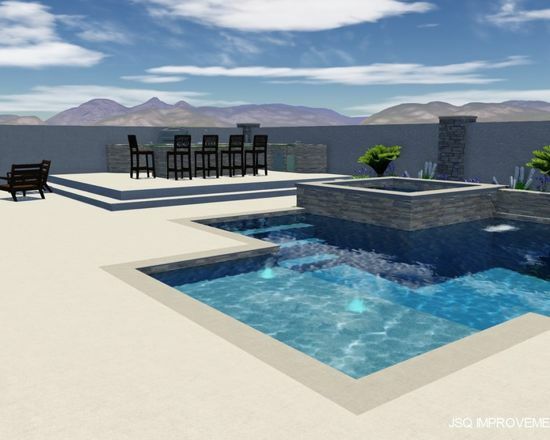 Ready for a new custom-built pool or spa? Contact us today to get a free evaluation.